Since it was established, DCU has been renowned for being cutting edge and forward thinking. We work closely with industry to give students a modern, relevant, well-researched curriculum delivered in world-class facilities and labs. We are noted for having an entrepreneurial, innovative and creative culture. 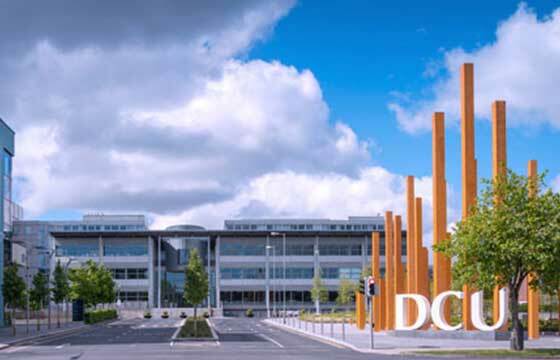 We are renowned for our excellent employability statistics and the success of our graduates.Students will be part of a cosmopolitan and diverse community of over 2,300 international students at DCU. Almost one in five students here, and two in five research postgraduates, are international. The university is home to a cosmopolitan and diverse community, with students coming from 109 countries. Our 85-acre campus is one of the safest in Ireland. It features bright modern architecture, and was planned to encourage interaction. Students will find it’s a place where they can live, learn and develop in a bustling yet intimate environment. There are seven restaurants and cafes on our campus. As DCU is in a residential area 20 minutes from Dublin city centre (3.5 miles/6km) students will enjoy the best of both worlds. It’s an easy commute on foot or by bike to your studies and you are still close to the vibrant heart of a capital city in your free time. The on-campus Dublin Bus stop offers another easy way to get around.The safety and health of our students is of upmost important to us. We have a health centre on campus, a doctor on call and 24 hour campus security. Our strong Careers Service gives you the opportunity to get advice on your CV and go to recruitment events. There are regular employer networking events and an online job vacancy system. Careers Advisors work with students who have specific career goals and also with those who don’t. The ultimate aim is to increase your competitiveness in the job market. One of the exciting parts of laying foundations for your future is the chance to study abroad (in a country other than Ireland) for part of your course. Depending on your course choice you may get to study abroad for a semester or year with one of our partner institutions in Europe, America or Asia. 5 Undergraduate Tuition Fee Scholarships of â‚¬3,000 each for 1st Year and â‚¬2,000 for subsequent years. 5 postgraduate scholarships of â‚¬2,000 each .